See, the pink fading into brown, and then the baby poop green? I just don’t know. I’m making a baby blanket out of Noro Silk Garden sock yarn. I love this yarn– it is from Japan, and has lovely color gradations- I made a cowl and leg warmers from a colorway with copper and greens and blues. I am working on a scarf in a colorway with deep purples and teals. 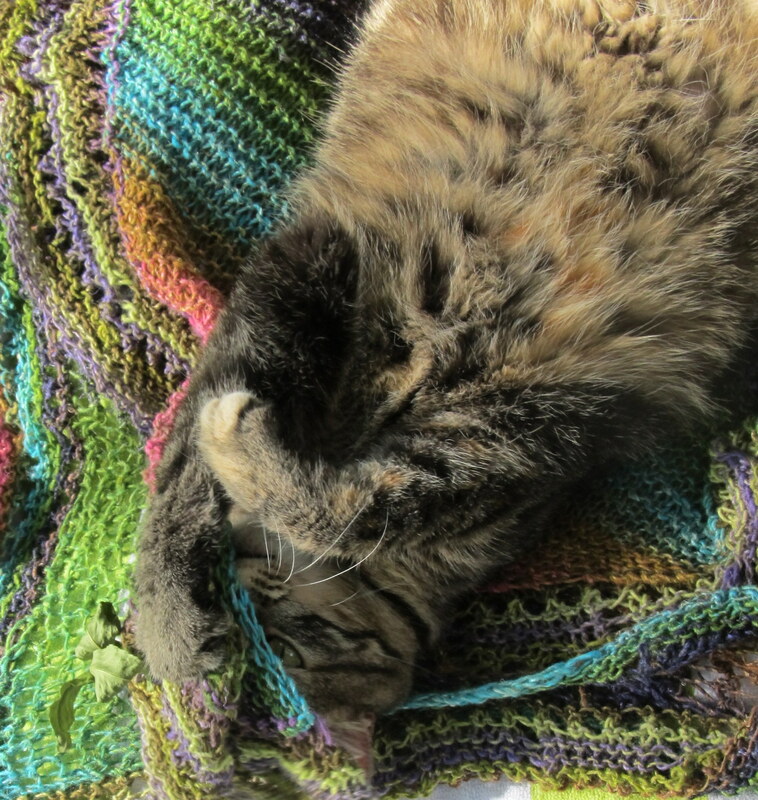 This baby blanket makes me wonder…on the one hand, it has bright pink and turquise…fading into brown. Then on the other hand it has purple and indigo and green…and green…and another green…a green that can really only be described as “macrame green.” Or avocado green- some kind of green from the 70’s. I’ve been working on it a while, and I go back and forth between thinking it’s super cute…and thinking it is ghastly. There is a kindergartner whose brother takes a Tae Kwan Do class while my kids do, and Erin, the kindergartener, keeps track of my progress. She is very interested in the baby, and the process of the blanket. She has serious doubts about the color combo, though. She’s polite, and she’ll say she likes the pink, but then she gets a crinkle in her forehead. I get a crinkle in my forehead, too. The pattern is from Knitting Wrapsody and it has an interesting construction- it starts with a square, which is divided into quarters, then triangles are picked up along each edge, then more triangles are picked up along those edges, then a rectangular border. Because of the way the colors fade into each other, sometimes the stripes on the picked up edges… clash. I don’t know. every time I look at it, I change opinions. So, look at the pictures- funky or fugly? Alice really likes it- you’d think I made it out of catnip. I think it’s super fun and funky! I can imagine the baby portraits now….just dress the baby monochromatically. Awesome! Plus it will hide the inevitable spit up stains very nicely. I vote for funky! I actually really like it. I’ve used some color-gradation (gradated? gradiated? graduated?) yarns, and it’s always fun to see the patterns that come out of them. I personally love the colors. Don’t let the kindergartner’s furrowed brow worry you! It’s great! The colors are fun and earthy. Thank you all for your input- it is going to the house of it’s future owner, who is still under fetal development, today. It was fun to see everyone’s reaction. I love it! Love, love, love it! I am not a stuff kind of girl, still I wish it was mine! Thanks for commenting on my blog. Lots of blog love right back at cha’! i love the combinations of colors. 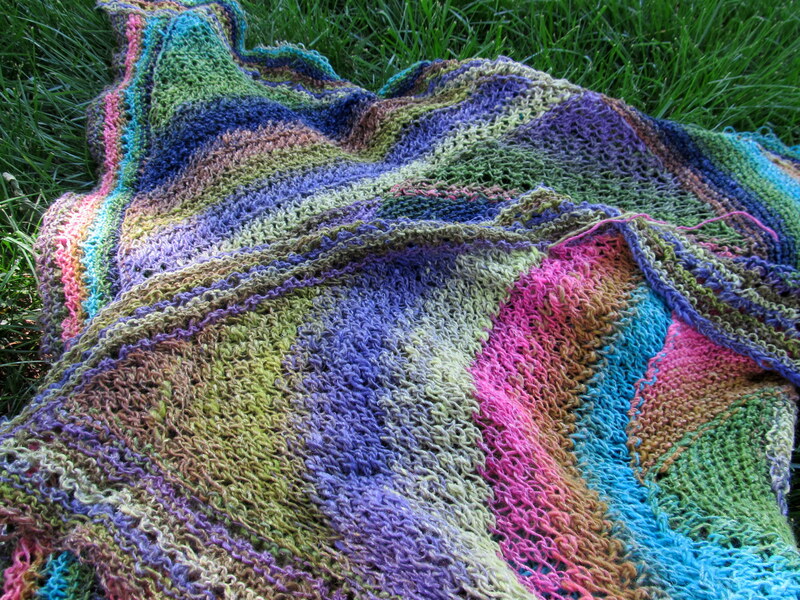 they may not all traditionally go together, but the combination in this blanket is amazing. (i love all the colors in it) it goes with everything!